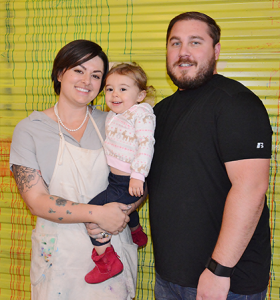 Alise Frosceno celebrated the grand opening of her new studio with her family, including daughter Gwendolynn and husband Anthony. The new Stuff and Things Art Studio had just that, stuff and things, like the assortment of arts and crafts, colorful walls with characters painted on them and a relaxed, fun, environment that welcomed the creative and those eager to learn. Located at 3220 Santa Fe St., Suite C, in Riverbank, the recently held grand opening for the art studio had activities for all ages. There was a paint wall where guests could take a balloon filled with paint and throw it at the wall to make a color splash. The roll up door was turned into a paint wall and you had to be sure to throw the balloon hard enough so that it splattered and didn’t bounce back. “There is something so satisfying about creating art in a manner of which we are always told is ‘not’ okay … like throwing a water balloon, let alone a water balloon filled with paint indoors,” stated Alise Frosceno, owner and operator of the art studio. With a mixed variety of artistic talents, Frosceno hit the downtown area and brought her love of art with her and also is excited to bring her studio to the area. After serving the country in the Army and the National Guard, Frosceno was ready to come back home and open her very own studio. Frosceno does not have a favorite type of art, but has a love for all mediums and styles and likes to try all of them. Currently she has been engaging in polymer clay creations and mixed medium paint. With art supplies taking up all the storage in their home, Frosceno thought she would dabble in a few mobile events. This led to participation in the Oakdale National Night Out and the Funky Flea Market as well as a few impromptu events held at area parks. The studio is open during the day for Open Studio sessions where fellow artists can engage in creating whatever they want. There is a charge for the time spent at the studio but not the materials. The unique location has paintings that Frosceno did herself inside and out with a large tree and flowers on the outside and a sign that her family made. The tables were all hand painted and made from her creativity. Ages from two years old on up are welcome, but children must be accompanied by a parent or guardian and there are age specific events as well. Hours are 3:30 p.m. to 7:30 p.m. Wednesday through Saturday. Open Studio sessions are available for $15 for the day. She also does events and party rentals. For more information, visit Stuff and Things Art Studio on Facebook or call 850-6061.